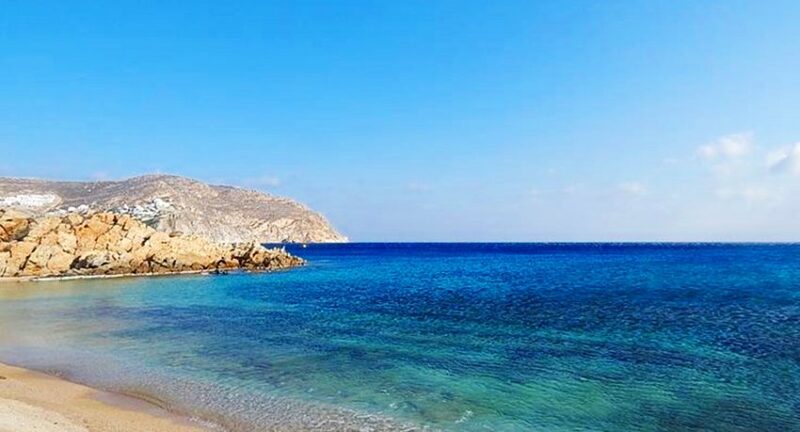 Agrari beach is a very beautiful beach of Mykonos with pristine beauty, quiet and more isolated, so ideal for those who do not like crowds, and that’s the reason why is a popular destination for nudists. On the south side of the island of Mykonos, next to Elia beach, there is Agrari beach, forming an immense golden Beach sheltered from the north winds. From Chora of Mykonos, Agrari is the most appropriate beach to feel the calmest summer dip. Deep waters, relaxed environment, it offers facilities for coffee, food from organic products, sunbeds, parasols, showers and free wi–fi. It has long golden sandy beach, which is divided into left and right sides with umbrellas, water sports and a wonderful Greek tavern with traditional Greek food. The route is a bit difficult, but the soft sand and the crystal blue waters will compensate you the moment you will arrive. Agrari is one of the most beautiful beaches of Mykonos and Mr Thanassis will help you at the beach providing deck chairs and umbrellas will make you feel the calmest summer dip. For those who have no transportation, it is accessible by bus from the beach of Platis Gialos, and from there by boat or by your own vehicles of transports. Mykonos island will provide you the best combination of relaxed holidays. From the other side Mykonos is famous about the nightlife and for the huge beach parties which lasts until morning. Choose the island of wind and visit Greece and Agrari beach for your vacations. Let Greek people show you their hospitality. Distance from the town: 7km.